Relish the memory. : The Best of 2013: Relished memories & Katering escapades. The Best of 2013: Relished memories & Katering escapades. Well, well, well what a pleasurable year 2013 has been: adventurous, tasteful, overindulgent and laden with all things food. To celebrate another year of feasting I thought I would share an update of my latest Katering escapades and a snippet of 2013's greatest eats. Firstly a Christmas party with the task to cater pre and post dinner treats for the elves that work their magic as Radiation Therapists. 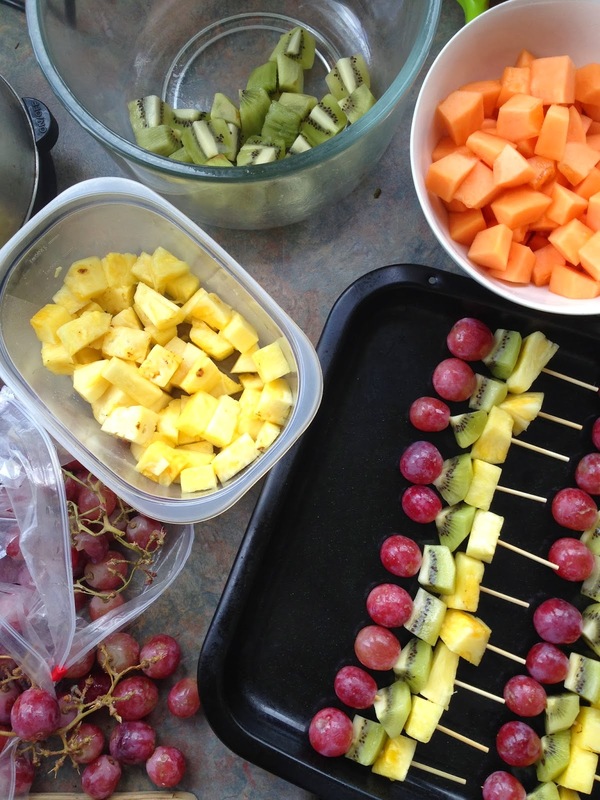 To sustain them through a night of competitive lawn bowls (and drinking!) I put together a simple range of tasty dips, veggie sticks and corn chips. Think coriander, peanut & sweet chilli dip, garlic hummus, moroccan carrot, spicy guacamole and the classic favourite - onion dip. It was just a nibble – although most bowls were licked clean. 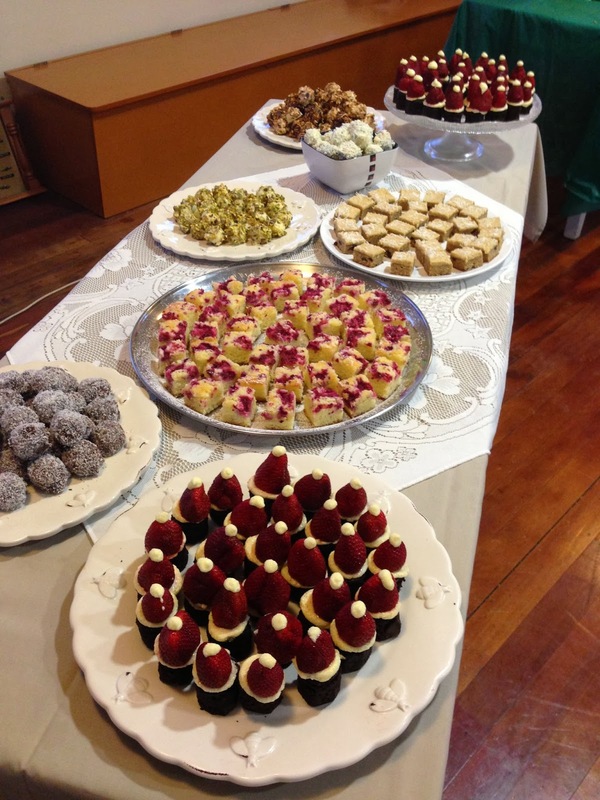 The night got even sweeter, with a dessert spread fit for kings and queens. Inspired by trawling the net I included a few very festive Santa Hat Brownies. Rounds of decadent chocolate brownie, were topped with vanilla mascarpone, plump, ripe strawberries and finished with a mascarpone pom-pom. Dusted with a sprinkle of snow (icing sugar) they looked seriously cute. I do recommend using a more substantial creamy filling - humidity got the better of mine and a few strawbs had a slippery slope to their death. Platefuls of my go-to dessert Raspberry Coconut Slice were contrasted with simple yet elegant mini fruit kebabs – loaded with grapes, melon, kiwifruit and pineapple. While a new addition to my repertoire, Joy Slice made its debut -a slightly more festive and chewy take on the ginger crunch. Complete with a variety of truffles including: White Chocolate and Honey covered in Toasted Almonds & Pistachios as well as Coconut Chocolate Truffles filled with a Chocolate Brownie centre. Phew! Another bunch of satisfied sweetened souls. On to the next Katering gig this time for the talented creative collaborative that is – Collectif Magazine. A few savoury morsels to help celebrate the launch of their 6th edition was a highlight of my festive season. I recommend getting your hands on this news print publication ASAP. Sophie and her contributors are seriously talented and you can see their passion springing from each page. Held within the walls of Terrarium, Kingsland it was very humbling to share and help celebrate such innovative young creative’s. Saffron Chickpea Falafels w. Orange Tahini Dipping Sauce. After being gifted a precious box of Saffron threads I had just the thing for the occasion. Inspired by the stunning blog that is Green Kitchen Stories I recreated their mini Saffron Chickpea Falafels and served them with an Orange tahini dipping sauce. Back on the Mexican buzz I opted for a few bowls of chunky salsa – one with avocado, tomato and cucumber and the other pineapple, black bean and coriander – perfect served with jalapeno corn chips. However what seemed to be the dish of the day and one that came and went in record time was the platter of mini mint, pea & feta fritters served with a citrus yoghurt dipping sauce. Juicy, moreish and packed with flavour – sprinkled with pomegranate seeds they were pretty jolly spectacular. And I am chuffed to say they held their own against a gorgeous array of Milk Moustache & Cookie Bar Cookies (of which I may have had 3!). Moderation – right? 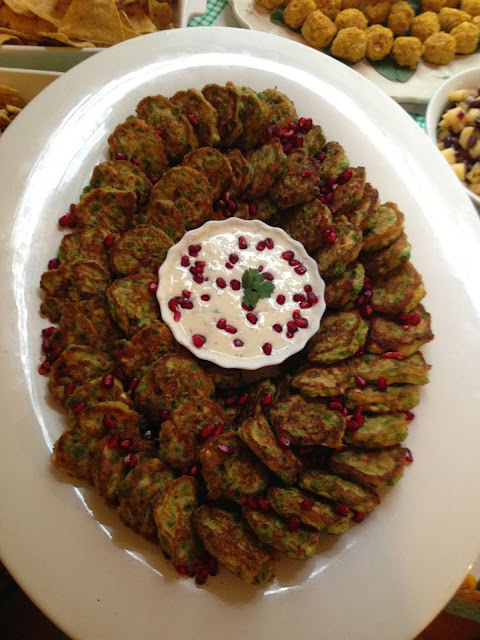 Mini Mint, Pea & Feta Fritters made beautiful with Pomegranate Arils! So that was that – two more successful Katering gigs down and even more food to be savoured. Caramelised Pork Hock from MooChowChow. The Flakiest of Roti at Sri Panang on K Road. Orange and Almond Cake with Marmalade Ice Cream at Riverstone Kitchen. Bliss. Deconstructed Carrot Cake c/o Nick Honeymoon from Everybody’s Izakaya. All things Al Brown – Depot’s Fig Toasties, Best Ugly Bagels, Fed Deli’s Smoked Kahawai Fritters and Whitestone’s Smoked Butter. Bless that man. Lemon Creme Fraiche & Blueberry Tart - an off the cuff collaborative creation ft. R.Murds. Fish & chips cooked by Thomas & Lilian at Greenwoods Fresh Catch, Epsom. Best Coffee Award goes to Cereal Killa & Good One Cafe, Douglas St.
Custard Square and Rosemary Loaf from Love Rosie Bakery in Tauranga. Salted Caramel Gelato on a stick from Ortolana + Tiramisu Gelato from Giapo. Pomegranate seeds and their ability to make any dish magical. Dad’s catch ft. Whitebait Fritters and Lake Rotoiti Trout hot off the smoker. Raspberry Coconut Slice for its impeccable flavour and reliability. Toasted Coconut Butter - what dreams are made of. Homemade Raw Chocolate – melted coconut oil, cocoa/cacao, honey/maple syrup & sea salt. 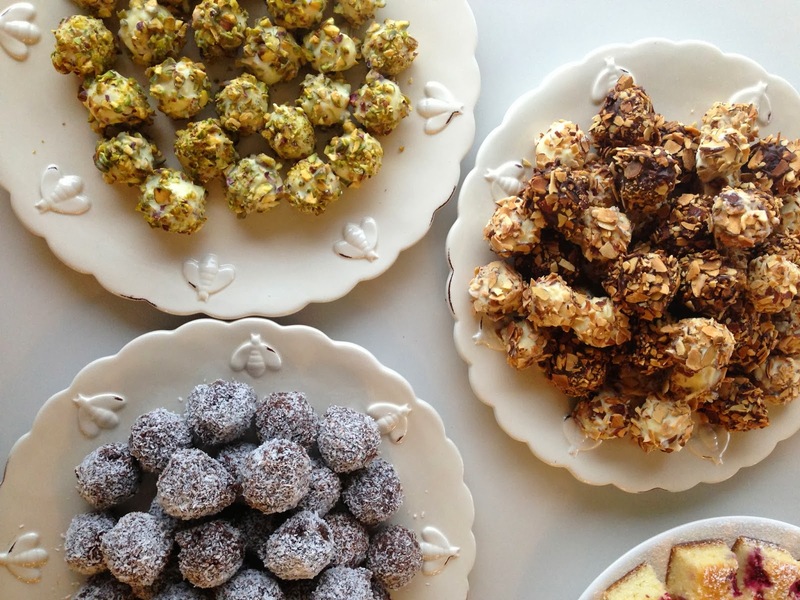 Lemon Coconut Truffles + all the other wonderful creations from Petite Kitchen. Everything that touched my lips from Little Bird Unbakery – minus the price tag! Zoodles and Toodles – zucchini and tofu noodles! Salted Caramel Spiced Banana Cakes. Sweet Breakfast Omelettes inspired by The Holistic Ingredient. See what I mean - where do I stop! To find snaps of these images or for a more frequent rendition of my feasting moments follow @relishthememory on Instagram. To add to the excitement, after all this years’ venting, photographing, eating, and writing about food I have managed to acquire my very first published piece!!! 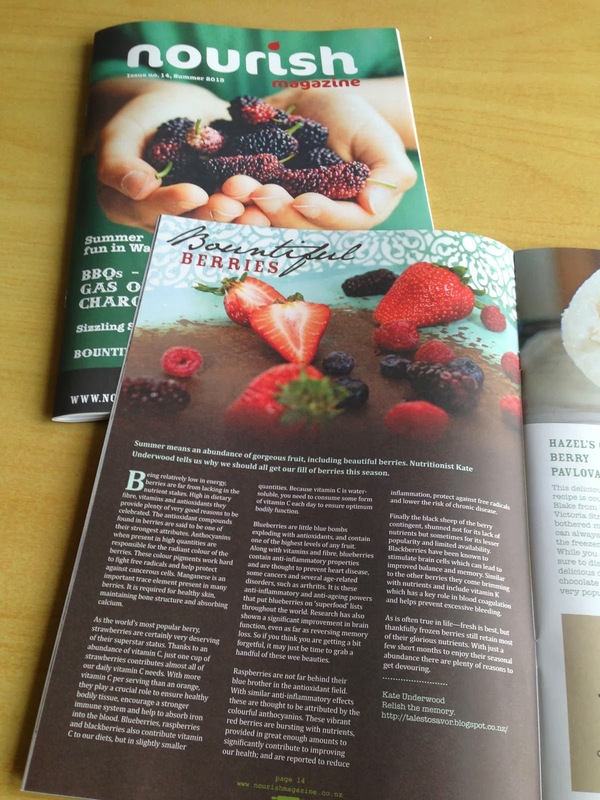 The talented Vicki from Nourish Magazine entrusted me to write about the true beauties that are ‘Bountiful Berries’. Pick up a copy of the December issue at your local café or check it out online here. A kiwi publication focusing on local fare from the Waikato and Bay of Plenty regions. And finally, it seems that the hospitality scene just can’t keep me away. With such fond memories of my Nova days I have spent the last month crafting menus, elbow deep in flour - baking scones, filling cabinets with cakes and polishing my skills on the coffee machine. 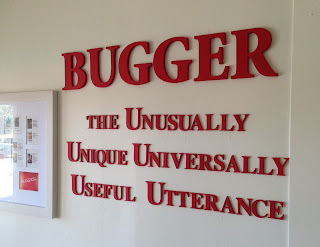 I am officially back in the game… BUGGER (Cafe)! Pop in and say hi! Bugger Cafe...Thames NZ.